When we asked Jenna from OY for advice for oyster-rookies, we were being quite practical: till recently, WeAteHipsters crew was divided into 2 groups – “Haven’t tried” and “Never again”. Papilion, the smaller sort with moderate taste. Fine de claire, with very distinct and salty taste. Gillardeau – the more meaty sort. Gillardeau oysters are so prized that the Gillardeau family recently began laser-engraving their shells to prevent rampant worldwide counterfeiting. Following Jenna’s advice, we started off with one of each type. The excitement was growing. We watched the shuckers opening the oysters for us one by one, enjoying our drinks at the same time. The night was off to a promising start. Both the Champagne and Sauvignon Blanc we had were excellent and helped ease any nerves as we awaited to end our oyster virginity. 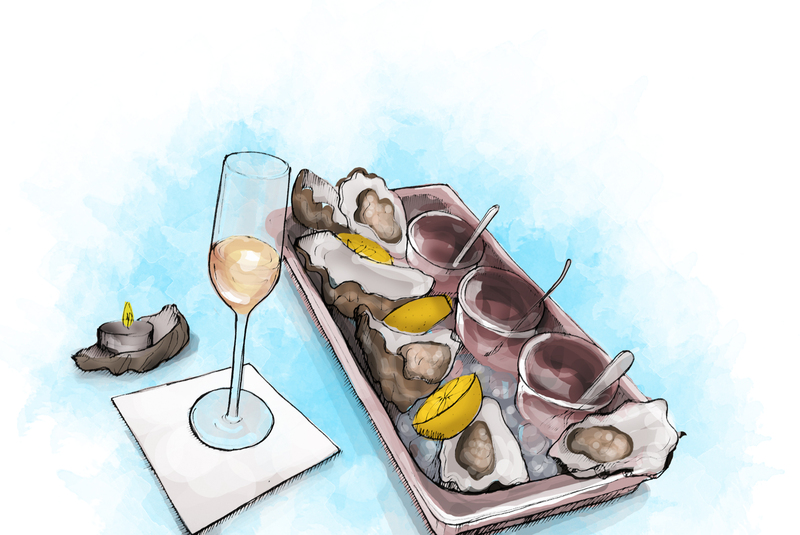 The term shucking describes the opening of oysters and rendering their meats readily accessible for consumption or further processing. The oysters arrived: served on ice, with 3 types of perfectly matching vinaigrette and bread and butter served in a neat little paper bag. Here comes the moment of truth. Smelling first – if you close your eyes, you might think you are on the French coast. A drop of lemon – and here I am, out of the “Haven’ tried” group, and definitely NOT joining the “Never again” club. I seem to have picked the perfect “first time” – oysters are top quality and perfectly fresh, every next one feels like a refreshing sip of sea on the middle of dull Berlin winter. Fine de claire oysters are finished in knee-deep claire (rectangular salt ponds) where they fatten and take on a sweeter, fruitier flavor from the water and phytoplankton in the ponds. If you are not as easily excitable, and oysters have lost that unique taste for you, we bet you still be delighted by the experience you will get. Attention to details at OY is brought to the next level and definitely makes it stand out among the pop ups as well as regular restaurants. Every little thing counts: groovy hip-hop playlist, disco ball in the corner, fresh flowers on the tables, bread being served in a paper bag with a little tube of butter and a butter knife (like, really, how often do you get to use butter knives?) of course, Jenna herself being lovely with all guests. Hats off, OY, we are surely coming back . And so should you – OY is up for only 3 more weeks!